My husband made this nativity scene in his wood shop from a pattern many years ago. My photography doesn’t do it justice, but for our family, displaying this in our front yard throughout the holiday season makes Christmas so much more special. At night, it’s so dark and peaceful at the end of our street, and the simple figures make a beautiful impact. It just wouldn’t be Christmas without it. From our family to yours, we wish you some silent, peaceful contemplative moments in the middle of the holiday rush. Merry Christmas and Happy 2016 to all! Peace. < Draw a Bird in December? The nativity scene is beautiful Laura. A Merry Christmas and Happy New Year to you and your family. Thank you so much, Denis! This is very beautiful, the minimalism really captures the gracefulness. Merry christmas! We could all use some more of that, huh? Thank you. Merry Christmas and Happy New Year to you and your family, Laura. Thank you so much, Lia! Hugs & love to you! Okay…we have already established that you and I must be sisters, but could it be that our husbands are brothers? My husband made to wooden deer for our front yard (to go with the nativity my Dad made) and loves to do woodworking in his spare time. He made glider rockers for our deck this year. 🙂 Beautiful scene. Love to you, Jean! So glad you enjoyed! 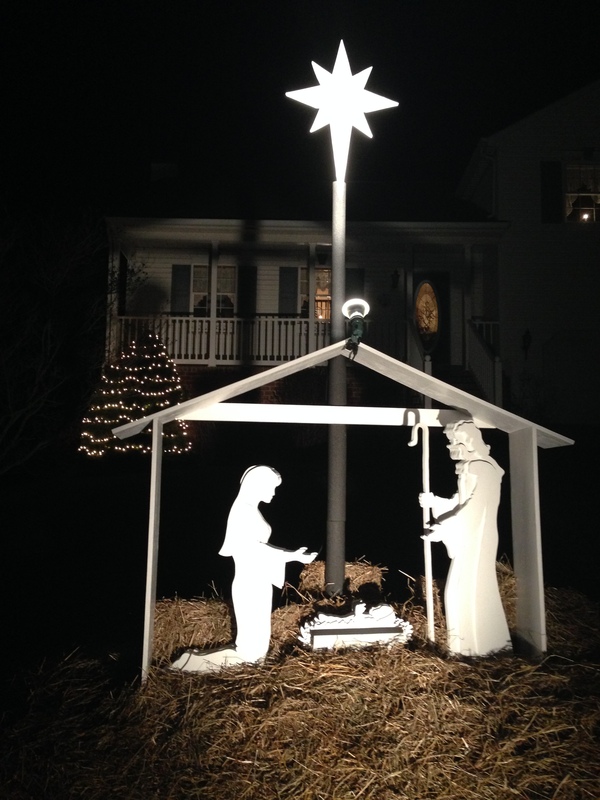 I have been looking forward to seeing your hubby’s nativity display, and it was worth the wait! It is the perfect depiction of Silent Night yet speaks volumes! Peace, love, and hugs to you. Merry Christmas!! Thanks so much, Carol! So glad you enjoyed it! Sending love & hugs back! Beautiful! Nice to see “Christmas” scene and not just “Happy Holidays” . Merry Christmas! Very special and beautiful indeed. Wishing you and your family a wonderful Christmas! Peace to you and your family, and our world! Thank you Laura. Thank you so much, Sharon, and boy could we use a triple dose of that for the whole world. Thanks as always for your comments and visits! It truly is beautiful. A Merry Christmas to you and your family and a very creative 2016! I think this is the perfect Christmas decoration! Wow, thank you so much! I really appreciate your comment & visit! Thanks so much, Jill! Sending hugs! Wow!! Hubby did GOOD! This is beautifully done! What a lovely tradition to have! ❤️😃 Hope you guys have a very Merry Christmas!! hehe… I bet it’s just not possible with all the white light. Kind of like a beautiful sunset! I bet it’s really over the top awesome in person! aww thanks, Charlie… 🙂 It is quietly lovely. I think that’s why I love it. What a beautiful work of art. Nice to have a handy hubby. Thank you so much, Julie. I’m so glad you enjoyed it! Hugs and peace to you. Just lovely. Peace to you all. That’s so beautiful! Woodshop…like in 7th grade mandatory Woodshop for a quarter? I was lucky I got out of that class with my fingers still in place, and making a couple of okay things that are long gone now. What a lovely treasure he created for your family, and quite wonderful that the neighbors get to share its beauty and message too. Merry Christmas to you and your family Laura! So beautiful! Merry Christmas, and may the peace and joy of Jesus’ birth be yours! Thank you so kindly! What more can we hope for than that? Blessings to you and yours! Thanks so much, Myriam, and the same to you! Imagine how many birds you may wind up drawing in 2016! One a week would be most ambitious. Two a month could be groovy :-). Simple….yet elegant. Beautiful! Hope you holidays were heart-warming and peace to all for 2016. This is beautiful Laura, your husband is v talented, I took a closer look, and I noticed it also has dimension just perfect and pure, like the story it tells, the light from the star is wonderful. Your husband should go into production. Thanks so much, Rebecca! :)) Yeah, the pattern was 3-D. It really is cool in person. I don’t think my photos are doing it much justice. I’m glad you enjoyed it! Thanks and same to you, Margaret! Laura it is very special, it brings memories of my dad purchasing a wonky recycled nativity scene and repainting it. which went up every year. We use to look forward to it and as we aged it became very special in all its wonkiness. I loved the fact my father took the time to make our xmas special, even though he did not have much money. Thanks for bringing back special memories. This will stay in your family for always. Thank you so much, Kath, and I’m so glad this brought back great memories for you! Happy 2016 to you and your family!